Forget Guy Ritchie's recent interpretation of the world's most famous detective. 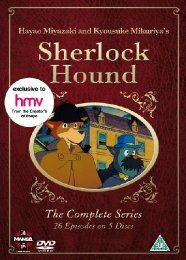 Sir Arthur Conan Doyle's super sleuth, Sherlock Holmes, gets a unique animated makeover courtesy of acclaimed writer-directors Hayao Miyazaki (Howl's Moving Castle; Spirited Away) and Kyosuke Mikuriya (Ulysses 31) in Sherlock Hound: The Complete Series. Brilliantly and wittily depicting all the characters as anthropomorphic dogs, Miyazaki and Mikuriya's version presents a light-hearted and imaginative series of canine capers featuring the famous dog detective and his loyal companion Dr. Watson as they set out to solve a myriad of mysteries and take on Holmes's arch-nemesis, the evil genius Professor Moriarty. Now, for the first time ever in the UK, all 26 episodes of this cult 1980s cartoon series have been collected together into one deluxe, five-disc DVD box set. Representing the early work of master animator Hayao Miyazaki prior to the establishment of Studio Ghibli and his subsequent international fame, Sherlock Hound: The Complete Series is a must-have addition to every anime fan's collection.